Last week’s blog about finding your pulse to know whether or not you’re in atrial fib left out one important factor. Thank you readers for alerting me that many patients don’t know what the average resting pulse rate should be. Besides being in a steady rhythm, the number of beats per minute at rest can vary for adults from 60 to 100 beats per minute. So, if you take your own pulse at the inside of your wrist or on your neck to the side of your windpipe, check the second hand on your watch or clock and count the beats for 15 seconds and multiply by 4. If you count 15 beats that’s a rate of 60 beats per minute…a good number. I take my pulse looking at the clock for a full minute because for years mine was irregular. It’s more accurate for a full 60 seconds. If your count is 20 beats in 15 seconds, that’s 80. 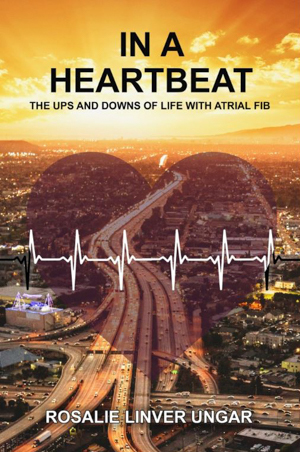 Read more about that in my memoir, IN A HEARTBEAT: The Ups & Downs of Life with Atrial Fib. A lower resting heart rate of 40 to 50 beats per minute usually indicates a more efficient heart function. Often this implies cardiovascular fitness. During exercise the rate can climb to as high as 120 or more, but when exercise ceases, the resting rate should return. However, if the heart rate is constantly above 100 at rest or always below 50, you should consult your doctor. It is documented that exercise is one of the best meds. Cardio workouts include elliptical, treadmill, spinning bike, rowing machine and sled. 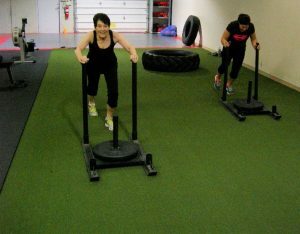 A picture of me pushing the sled is shown below. I used to do 100 pushups but since turning 80, my best is 50 with a 10 second rest at 25. This entry was posted in Blog on December 3, 2017 by Mark Layman.